Recently, the Federal Government began its formal review of the Copyright Act, and fair dealing rights will be an important consideration. Fair dealing has been specifically targeted by publishing industry lobbyists in anticipation of the review, particularly as applied for the purpose of education. This is a critical time for those who benefit from educational fair dealing to ensure their perspectives are heard and to ensure that those conducting the review appreciate the broad public interest in a robust fair dealing provision. Fair dealing allows for the limited use of copyright-protected materials without permission from or payment to the rights-holder. The purposes under which fair dealing can be applied are: research, private study, education, parody, satire, criticism and news reporting. If you can make a compelling case that a particular use of a copyright-protected work is for one of these purposes and that the use is fair, then that use is permissible under fair dealing. Fair dealing is used routinely by students and faculty members in a large number of ways, including copying journal articles or excerpts from books (for private study or research), as well as by the institution through providing access to copies of such articles or book excerpts to registered students through a course pack or on eClass (for education). If you value the preservation of fair dealing in general and for post-secondary education in particular, make sure your voice is heard. Don’t sit on the sidelines and allow fair dealing to be weakened, upsetting the balance of copyright law in Canada. More information about how to become involved in the review process will be shared as soon as the details have been announced. Fair Dealing Week 2018 will run from February 26 to March 2. In recognition, the Canadian Association of Research Libraries (CARL) is collecting fair dealing testimonials. If you have a story about your experience with fair dealing and how you and the public benefit from it, please consider submitting a testimonial. 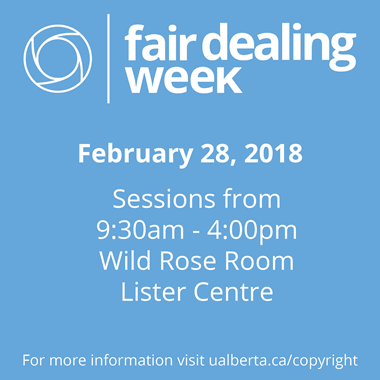 Additionally, the University of Alberta Copyright Office is hosting an event on Wednesday, February 28, also as part of Fair Dealing Week. More information about that event and how to register to attend is available here. Join us to Celebrate Open Education Week 2018! From March 5th through 9th, 2018 universities, colleges, schools and organizations around the world will be celebrating Open Education Week, including the University of Alberta. Open educational resources (OER) are any freely available material or media that facilitates teaching and learning. The possibilities for OERs are endless and they can include videos, podcasts, presentations and even textbooks. OERs provide faculty the flexibility to share, collaborate and draw on course materials from around the world, while reducing the cost of higher education by challenging expensive textbook prices. OERs also provide a practical and effective way to facilitate lifelong learning, an essential skill in our changing and complex world. Learn how OERs can strengthen teaching, engage students, and promote student well-being by attending the University of Alberta’s Open Education Week events. Will you have a heart for First Nations youth? This is what Sarah Auger, a doctoral student in Indigenous Peoples Education: Educational Policy Studies, asked library staff. And so, you can come to the H.T. Coutts Library to extend your hearts with us. From February 10-16, you can get more facts about inequities faced by First Nations youth in education, health, and child welfare; sign a giant valentine to let your representatives know you support this cause; or write a note of encouragement to young people in their work to achieve their goals. Have a Heart Day is a child and youth-led reconciliation event that brings together caring Canadians to help ensure First Nations children have the services they need to: grow up safely at home, get a good education, be healthy, and be proud of who they are. This event is promoted by the First Nations Child & Family Caring Society. Groups all across Canada are hosting events to support youth! In addition to events in different cities, youth and supporters will gather on Parliament Hill to promote love and fairness for First Nations children in celebration of Have a Heart Day. See images of more than 700 youth from 20 different schools (and their supporters) on Februrary 14, 2017. 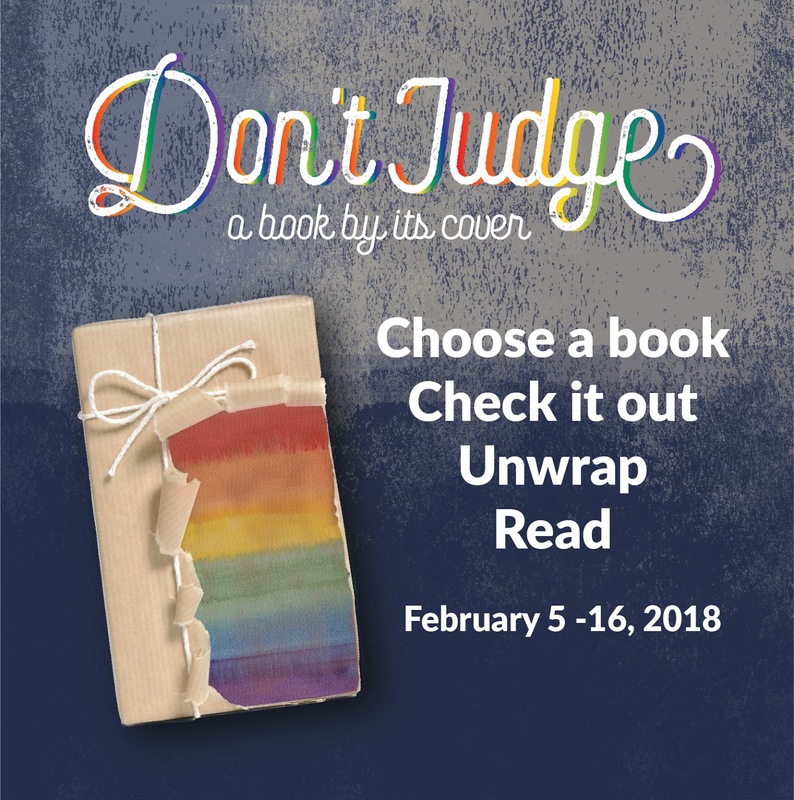 UAlberta Libraries' 2nd Annual Don’t Judge a Book By Its Cover starts Feb 5! Don’t Judge a Book By Its Cover is an annual event that aims to shed light on underrepresented groups. As a twist on regular book displays, books are wrapped in brown paper and teaser keywords are written on the front. This wrapping both symbolizes the marginalization of the featured group and adds a mystery element when selecting a book to read. You may remember last year’s event celebrating Black History Month. This year we have chosen LGBTQ2S+ as our theme and we will be featuring 400 books on display at 8 libraries! Stop in at one of our participating libraries: Rutherford, Coutts, Winspear, Cameron, Scott, Weir, Bibliothèque Saint-Jean and Augustana; February 5-16 and pick up something new to read. Canadian Literature Centre will present an encore screening of the presentation by Hiromi Goto. Novelist Hiromi Goto thinks through speculative fiction as a queer genre in her reading of "Notes from Liminal Spaces. Canadian Literature Centre will present an encore screening of the presentation by Playwright of Les feluettes, Michel Marc Bouchard. Visual AIDS: Alternate Endings Radical Beginnings. HIV Edmonton will screen the documentary film ‘Alternate Endings Radical Beginnings’ by Visual AIDS in collaboration with the University of Alberta Libraries and the Student Organization for Humanitarianism at UofA. The film screening will be followed by a discussion. Looking for other resources about LGBTQ2S+? Check out the Lesbian, Gay, Bisexual, Transgender, Queer Studies and Two-Spirit - LGBTQ2S+ library guide for research help and to connect to campus resources. We value your feedback! Fill in our Don’t Judge a Book By Its Cover survey and be entered to win 1 of 3 books featured in this year’s displays. Official rules below. 1. 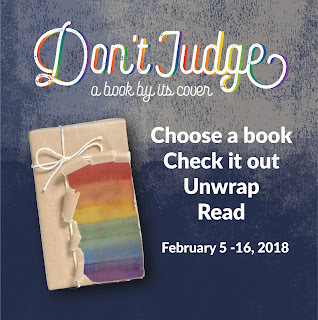 CONTEST: The “Don’t Judge a Book by its Cover” Contest (the “Contest”) is conducted by The Governors of the University of Alberta (“UAlberta”) and administered on behalf of UAlberta by the University of Alberta Libraries (“UAL”). The Contest is for participants to complete a survey about their experience in the “Don’t Judge a Book by its Cover” event (“Event”). In 2018, the Event will be featuring LGBTQ authors and stories. Participants will be invited via email to complete the survey. At the end of the survey, they have the opportunity to enter the Contest, in accordance with the eligibility criteria as set out in these Official Rules. b. A participant of the Event and who has completed the survey. You are not eligible for the Contest if you are a resident of Quebec or if you are an employee of UAL, including a member of the immediate family (defined as mother, father, brothers, sisters, sons, daughters and husband or wife, regardless of where they reside) or household of any of the above persons, their respective affiliates, agents, licensors, associates or representatives. You are also not eligible for the Contest if you have not participated in the Event. All decisions regarding eligibility to enter this Contest and the Entry Forms will be determined by UAlberta its sole discretion. This Contest is void where prohibited by law. 3. NUMBER, APPROXIMATE VALUE OF PRIZE AND CHANCES OF WINNING: There are three (3) prizes available to be won in this Contest (a “Prize”; collectively “Prizes”). The Prizes are described in paragraph 9 below. The chances of winning a Prize will depend on the number of Eligible Entrants received in accordance with these Official Rules during the Entry Period as defined herein. 4. CONTEST SCHEDULE: This Contest commences on Monday, February 5, 2018 at 8:00 a.m. (Edmonton Time) and closes on Wednesday, February 28, 2018 at 11:59 p.m. (Edmonton Time) (the “Entry Period”). Entry Forms must be received by UAL before the contest closing time, which is Wednesday, February 28, 2018 at 11:59 p.m. (Edmonton Time) (the “Contest Closing Time”) to be eligible to win the Prize. a. Participants will be asked to complete the “Don’t Judge a Book by its Cover” Survey and will be directed to the following online google Entry Form: https://goo.gl/forms/WxDvyeWNt3kDHy9T2 (the “Entry Form”). Each Eligible Entrant may only enter the Contest once. Once submitted, all Entry Forms become the property of UAlberta and will not be returned. All Entry Forms will be reviewed, and any Entry Forms which are deemed to be late, illegible, incomplete, inaccurate, inappropriate, offensive, plagiarized, subject to copyright or other intellectual property considerations, do not meet the Alberta Freedom of Information and Protection of Privacy Act (“FOIPP”) or privacy considerations, as set out in paragraph 19 herein, and otherwise, or which are deemed to not enhance the reputation of UAlberta, will be disqualified. The determination of whether an Entry Form is illegible, incomplete, offensive, late, or deemed not to enhance the reputation of UAlberta will be in the sole discretion of UAL. 6. PRIZE DRAW DETAILS: The draw will take place on Monday, March 5, 2018 at 1:00 p.m. (Edmonton Time). The Eligible Entrants who’s Entry Form is drawn at random and has complied with these Official Rules, including without limitation the provisions of paragraph 8 will be declared a Winner. If necessary, should a Prize be unclaimed, or should a Winner be unwilling, unable or ineligible to win the Prize as set out in these Official Rules, the Prize will be forfeited and UAlberta shall have the right, but not the obligation, to draw, as replacements only, an additional prize winner(s). All participants (including without limitation Eligible Entrants and Winners) must comply with these Official Rules. The determination of the Winners by UAlberta is final and binding. No communication with Eligible Entrants will be entered into except with the Winners which will be selected in accordance with these Official Rules. All matters related to the Contest and the verification of the eligibility of the Eligible Entrants and Winners will be conducted by UAlberta, or by persons designated by UAlberta in its sole and absolute discretion. All decisions made by UAlberta in this regard are final and binding and cannot be challenged. 7. NOTIFICATION: UAlberta will notify the Winners via email on Monday, March 5, 2018 by 1:30 p.m. (Edmonton time). UAL will contact the Winners using the information provided by an Eligible Entrant with the Entry Form. If a Winner does not contact UAL by Wednesday, March 7, 2018 at 5:00 p.m. (Edmonton Time), UAL shall have the right, but not the obligation, to select an alternative Winner. b. The Eligible Entrant correctly answers a skill-testing question as set out in these Official Rules. Once these requirements have taken place, the Eligible Entrants will be declared the winners (the “Winners”). 9. PRIZE: There will be three (3) Prizes, all of which are books titled “We Are Okay” by Nina LaCour, each valued in the amount of $23.99 (CDN). The total value of all Prizes is $72.00 (CDN). The Prizes are not transferable and must be accepted as awarded with no substitutions, except at the UAlberta’s sole discretion. UAlberta reserves the right to substitute the Prize of equivalent monetary value if UAlberta is unable to award the Prize as described. UAlberta will not be responsible, however, if factors beyond the UAlberta’s reasonable control prevents the Prize from being fulfilled. In any such event, the Winners will not be provided with a substitute prize or cash equivalent. The Prizes will only be granted to the verified Winners. The Winners of the Prizes will be required to pick up the Prizes in person at UAL, located in Rutherford Library. 10. SKILL TESTING QUESTION: To win a Prize, the Eligible Entrant must correctly answer unaided, the mathematical, time-limited, skill-testing question as follows: 70 multiplied by 3 divided by 2 =______ prior to being declared a Winner. 11. CONTEST MODIFICATION OR CANCELLATION: UAlberta reserves the right, without prior notice and at any time, to delay, or terminate the Contest, in whole or in part, or modify, suspend, amend or extend the Contest in any way, in its sole discretion including without limitation if UAlberta determines that the Contest is not practicable or is impaired or corrupted or that fraud or technical problems, failures or malfunctions (including without limitation, computer viruses, glitches or printing or production errors) have destroyed or severely undermined the proper conduct, integrity, and/or feasibility of the Contest. In the event UAL is prevented from continuing with the Contest as contemplated herein by any event beyond its control, including but not limited to fire, flood, natural or man-made epidemic or health or other means, earthquake, explosion, labour dispute or strike, act of God or public enemy, riot or civil disturbance, terrorist threat or activity, war or any federal, provincial or local government law, order, or regulation, public health crisis, the order of any court or jurisdiction, or by any other cause not reasonably within UAlberta’s control (each a “Force Majeure” event), then subject to any governmental approval which may be required, UAlberta shall have the right to modify, suspend, extend or terminate the Contest. 12. PARTICIPATION: Participation in this Contest constitutes an agreement by each Eligible Entrant to comply with these Official Rules. 13. DISQUALIFICATION: It is the Eligible Entrant’s responsibility to ensure that he/she has complied in full with all of the conditions and requirements contained in these Official Rules. If any Eligible Entrant or Entry Form is found to be ineligible, or if an Eligible Entrant has not complied with these Official Rules or declines the Prize for any reason prior to award, such Eligible Entrant or Entry Form will be disqualified and, in UAlberta’s sole discretion, an alternate Winner may be selected. No mechanically reproduced, illegible, incomplete, forged, software generated or other automated multiple entries will be accepted. UAlberta reserves the right, in its sole discretion, to disqualify any individual who is found to be tampering or attempting to tamper with the entry process or the operation of the Contest; to be acting in violation of these Official Rules; or to be acting in an unsportsmanlike or disruptive manner, or with the intent to disrupt or undermine the legitimate operation of this Contest, or to annoy, abuse, threaten or harass any other person. 14. RELEASE AND INDEMNIFICATION: By entering the Contest, each participant: (a) releases and agrees to hold UAlberta and its respective directors, officers, employees, and agents harmless from and against any and all costs, injuries, losses or damages of any kind, including, without limitation, bodily injury and property damage, or any other damage or loss, due in whole or in part, directly or indirectly, to participation in this Contest, any Contest related activity, or from acceptance, possession, use or misuse of any Prize, or participation in any Prize related activity; and (b) agrees to fully indemnify UAlberta and its respective directors, officers, employees, and agents from any and all claims on the part of any third party or parties related in any way and for any reason to the Contest or the Prize including, without limitation, death, and personal or property damage or injury. 15. LIMITATION OF LIABILITY: UAlberta assumes no responsibility or liability for incorrect, damaged, illegible, incomplete, mutilated, spoiled, destroyed, stolen, misplaced, lost, late, misdirected or incomplete Entry Forms, which may be judged void, any notifications, responses, replies, or for any computer, telephone, hardware, software or technical malfunctions that may occur. UAlberta assumes no responsibility for any theft or destruction or unauthorized access to, or alteration of, Entry Forms. UAlberta is not responsible for any injury or damage to participants in this Contest. 16. OFFICIAL RULES AND LAWS: These are the official Contest rules (the “Official Rules”). This Contest is governed by and construed and enforced in accordance with the laws of the Province of Alberta and federal laws of Canada applicable therein and the parties hereby attorn to the jurisdiction of the courts of the Province of Alberta. In the event a court determines that this Choice of Law clause is invalid or unenforceable as against an Entry Form, such Entry Form will be void. These Contest rules are subject to change without notice in order to comply with any applicable federal, provincial and municipal laws or the policy of any other entity having jurisdiction over the UAlberta. These Official Rules, as amended from time to time, will be posted on the website at http://ualbertalibrarynews.blogspot.ca/. 17. CONSTRUCTION: Words importing the singular shall include the plural and vice versa. The invalidity or unenforceability of any provision of these Official Rules shall not affect the validity or enforceability of any other provision. In the event that any provision is determined to be invalid or otherwise unenforceable or illegal, these Official Rules shall otherwise remain in effect and be construed in accordance with their terms as if the invalid or illegal provision were not contained in these Official Rules. Headings and captions are used in these Official Rules solely for ease of reference, and shall not be deemed to affect in any manner the meaning or intent of these Official Rules or any provision hereof. These Official Rules cannot be modified or amended in any way except in writing by a duly authorized representative of the UAlberta. Employees of UAlberta are not authorized to modify, amend or waive these Official Rules. 18. PRIVACY: The personal information requested pursuant to these Official Rules is collected, used and disclosed under the authority of the Alberta Freedom of Information and Protection of Privacy Act (“FOIPP”) and will be protected in accordance with Part 2 of that Act. It will be collected, used and disclosed for the purpose of administration of the Contest. All personal information collected for the purposes of administration of the Contest will be retained for two (2) years from the closing of the Contest. Direct any questions about this collection, use or disclosure to: Amy Southgate at southgat@ualberta.ca.